NTP vs. PTP - Which GPS Time Server do I need? Already know what you need? Scroll down to make your selection or CLICK HERE NOW! If you are still not sure, we've compiled a feature comparison to help you parse out the diffences between the TM1000A and TM2000A and see which one best meets your requirements. Both GPS timeservers are durable, accurate, and made in the USA! * This version is NOT compatible with the Verizon eFemto products. See www.css-design.com for more information. The TimeMachines GPS NTP+PTP Network Time Server represents a major step forward in capabilities at a breakthrough price point. It will supply accurate time for all computers and time keeping devices on the network. Supporting both Precision Time Protocol (PTP) and Network Time Protocol (NTP), a Stratum 1 time source can now be available on the local network with no need for an internet connection. 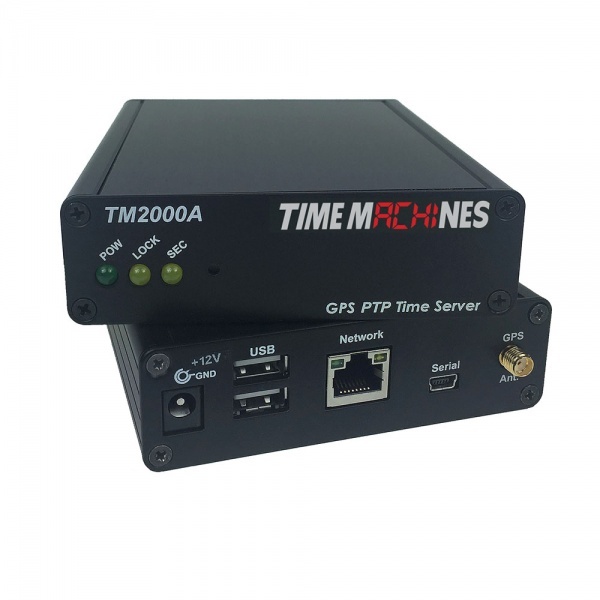 The TM2000A system uses an active GPS antenna to maintain the current time as broadcast by United States GPS satellites planet wide. In addition, a high stability OCXO reference clock is included that allows the unit to serve time if GPS lock is lost for periods of time. The unit is small and can be placed anywhere within the network layout. The built in high sensitivity GPS receiver is able to lock multiple satellites from within many buildings or from a window location, removing the requirement that outdoor antennas be installed in many applications. Outdoor antennas are available from TimeMachines including custom length cables and accessories. 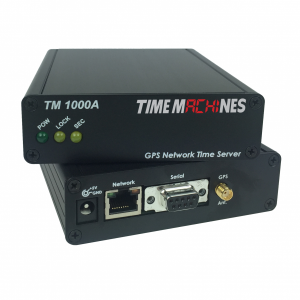 To learn more about our GPS NTP and PTP time servers, give us a call today.